IMS has developed a range of exhaust gas silencers designed to meet the requirements of every kind of application. The silencers use reactive and absorptive principles, or a combination of both.We provide a wide range of silencers from basic industrial absorptive silencers such as the FP range to the super-critical MRA3 range, capable of handling even greater environmental demands. Spark arrestors or catalysts can also be incorporated, as detailed in one of the following sections. 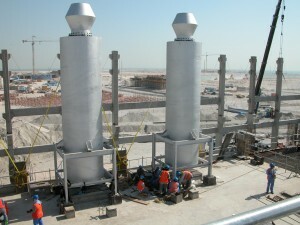 Where space is restricted and a more unusual configuration is required, IMS offers a range of two, three and four pass box silencers with variable inlet and outlet positions to suit particular installations.IMS exhaust gas silencers are installed around the world, reducing the noise levels of diesel and gas engines in applications as diverse as power generation, petro-chemical, railroad and marine.In addition we have our own in-house test facility which enables us to conduct extensive testing for noise, back pressure, materials and construction.